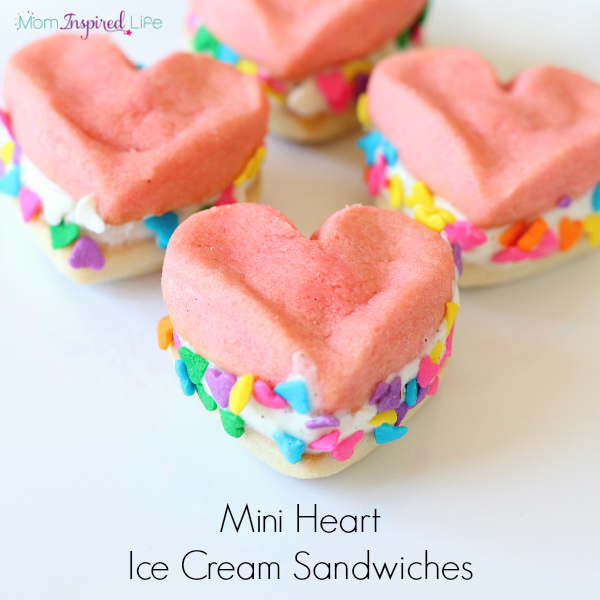 These mini heart ice cream sandwiches are so easy to make and are a fun Valentine’s Day dessert for my kids! You can even have them help you make them. 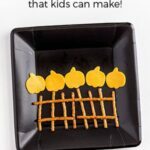 I really enjoy making fun food for my kids – especially around all of the different holidays. I think it just adds to the fun of the holiday and makes it extra special. I don’t have tons of time to make elaborate treats and desserts, but I can add a little something special. This is my way to do just that. 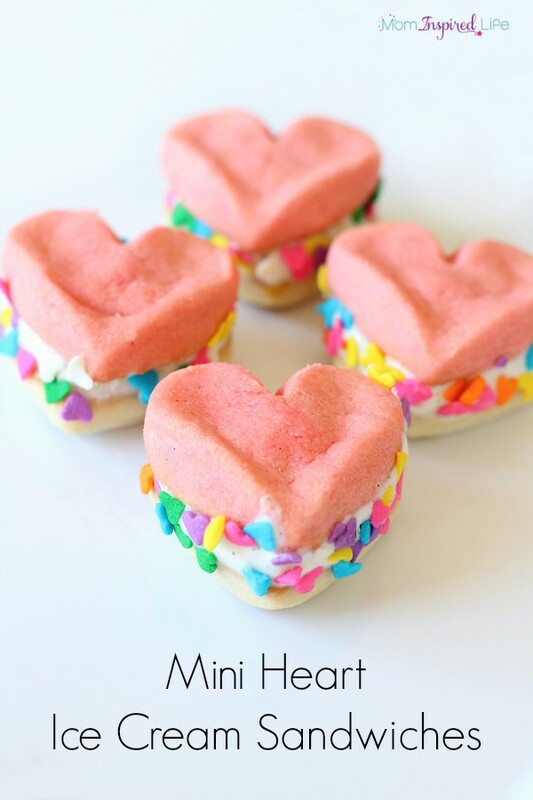 The other day I was shopping at the grocery store and I spotted some cookie dough hearts from Pillsbury. I had to grab them because I am sucker for those pre-made holiday cookie dough packages. 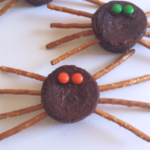 All I have to do is place them on a cookie sheet and bake for a fun holiday treat! This time I decided to take it a step further and make ice cream sandwiches with the cookies. 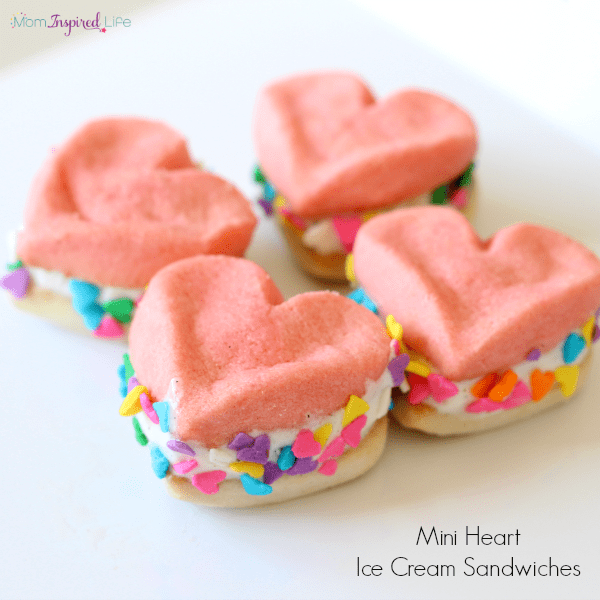 The little heart cookies made for the perfect mini heart ice cream sandwich. 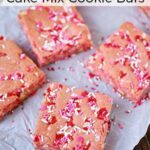 Bake cookies according to package directions or the recipe you are following. After baking, let the cookies cool completely. Put a large spoonful of ice cream on top of one cookie. Then take another cookie, place it on top of the ice cream and press down gently. Pour a pile of sprinkles on a plate and roll the sides of the ice cream sandwich in it so that they stick to the ice cream. Put a plate in the freezer and place each ice cream sandwich on the plate when you are finished with it. This way the first ones aren’t melting while you do the others. Enjoy one with your kids! 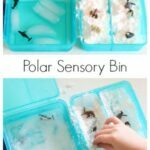 Store them in a covered container in the freezer. 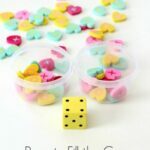 My kids thought these were so fun and it was a great way to add an extra special touch to the week leading up to Valentine’s Day! 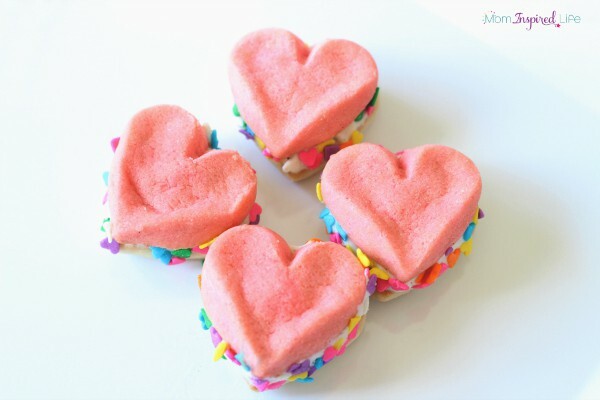 Here are some Valentine’s Day activities I think your kids will enjoy! 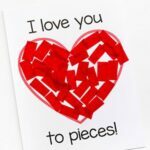 I Love You to Pieces Valentine’s Day Craft – with free printable!